This is an important yet simple and easy to use bit of kit. Getting the SWR right is crucial not just for getting decent range but also because a high SWR reading can damage your CB - all our CB's have a years guarantee but this does not cover the output transistor (the bit that can be damaged) as it's down to you to install it right, and get a low SWR. Using an SWR meter allows you to check the readings and make any adjustments necessary, making sure you don't have any problems like this! If anything is unclear or you have any questions, please feel free to get in touch by email or phone. When setting up your aerial installation, you must use a special test meter called an SWR meter to make sure that the ground connection is good, and the aerial is the right length. All SWR measurements should be taken with the vehicle in an open area, at least 20 feet from buildings and never inside a garage or carport. The vehicles' doors should also be closed. There are meters that only measure SWR, and ones that measure SWR and output power too, but we will deal with the SWR functions here and all the meters measure SWR in the same way. On the meter you will have a calibration control knob, and a switch with two settings. One may be marked FWD, DIR, or CAL and the other marked REF. These stand for forward power (to the aerial) and reflected power (back from the aerial). The reading actually shows you how much power is being reflected back from the aerial - obviously the less reflected back, the better. Firstly, go to channel 20 on the UK band. Put the switch to FWD and while transmitting, turn the knob so that the needle swings over to the far right of the scale. You will probably see the word SET or a red mark at the end of the scale - make the needle line up with this. Once this is done, and while still transmitting, switch over to REF and the needle should drop down to give you a nice low reading. If the needle hardly moves when you switch over or does not come out of the red portion of the scale - STOP transmitting - you have a problem, probably with the groundplane connection. A reading of below 1.5 is ideal, a reading of under 2 is ok, but a reading in the red part of the SWR meters' scale means that the SWR is high enough to possibly damage the set. If your readings are LOWER on channel 40 than they are on 1, then your aerial needs to be lengthened (by loosening the grub screw and pulling some of the whip out of the coil). A meter with a built in antenna matcher may help you reduce the readings if you can get it out of the red to start with - but you'll need to make sure you don't accidentally adjust the controls after you have set it up. Mark the settings and lock them by sticking tape over them (or similar) to prevent them moving. 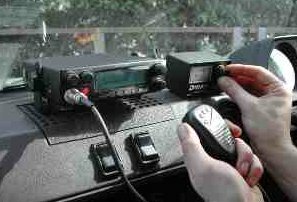 As the majority of CB use in the UK still happens on the UK band, the procedure above will allow you to tune the aerial for best coverage on that band, however if you want to check the aerials' SWR across both EU and UK bands, the principle is the same as for tuning to one band, but - you should use channel 20 on the EU band instead of channel 1 UK band, and channel 20 of the UK band instead of channel 40. If possible try to get these to read the same if you will be using both bands equally. The EU band is lower in frequency than the UK band - the lower the frequency, the longer its wavelength (which translates to length of aerial). This means that a better reading on the EU band means the aerial is too long. The same is true if the SWR is better on the UK band than on the EU band - the aerial is too short. However, if the readings are below 2.0 on all channels, there shouldn't be much need for finer adjustment. Incidentally, there is an unused gap the size of 20 channels between the two bands so if you do get the readings on 20EU and 20UK the same, the "resonant frequency" (the channel where the SWR would be perfect) will be between the bands. Should you keep the SWR meter inline? 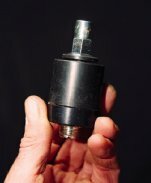 When there was a CB licence (abolished in 2006), they reccomended that SWR meters should only be used to check your antenna system, and then removed to minimise any chance of interference. I feel that this is more relevant to base stations causing TV interference than it is to people in vehicles, so I recommend having one inline permanently - if you have the space for it. The advantage with this is that if anything in the aerial system becomes damaged, or your ground connection goes bad, you will know about it much quicker than you would if you had to wait until you got home to check your SWR. This could prevent you damaging your set. The metal case of the basic SWR meter we sell can be easily removed by undoing 2 screws. This can then be drilled through and mounted flush on a surface, and the meter put back together again - an ideal way of saving space, and securing it inside or outside a cubby box for example.